Building a custom deck in Gainesville, VA, requires detailed planning to obtain the necessary zoning and building permit approvals. Contacting a licensed, established deck contractor like Hal Co. before you begin making decisions can save time, money, effort and frustration. Familiar with the Prince William County Development Services Division and the permitting process, the skilled professionals at Hal Co. can help you understand and transit the approval process with ease. Working with a competent and reputable deck builder means you have an expert consultant when seeking zoning approval for your custom deck in Gainesville. This is required to submit your building permit application, pass the building plan review, determine associated fees, and prepare for final inspection. Prince William County requires prior approval of detailed drawings for any custom deck construction. Also, if you plan to build a custom deck at your Gainesville, VA, home using “foreign lumber, plastic, or manufactured material the product has to receive an approved evaluation report from ICC-ES or from an accredited testing laboratory” before you receive approval of your construction plan. In addition to submitting a Building Permit Application Form you also need an Electrical Permit Application Form for safe and convenient electrical service on your custom deck to power features like outside lights, digital and entertainment devices, and outdoor kitchen equipment. Working together with your custom deck contractor will make your construction experience easier, more efficient, and less costly. And, when planning your custom deck in Gainesville, VA, Hal Co.’s familiarity with local regulations and commitment to cutting-edge deck design will be of great value. Collect ideas for your custom deck design and features you find inspiring, then contact the deck professionals at Hal Co. to help bring all those details together. Together we can create a custom deck at your Gainesville, VA, home you will enjoy for many years to come. Innovative commercial fences offer Gainesville, VA, business owners smart solutions for security, privacy, access control, pedestrian and traffic flow, and also in creating the style, look, and feel that makes your operation really stand out. Innovative fence design integrates enhanced commercial-grade fencing with mixed materials and architectural elements for unique custom commercial fences in Gainesville, VA, that deliver long-lasting performance. Commercial fences can act as memorable landscape features that also capture the attention of those passing by, or customers searching for your Gainesville location. 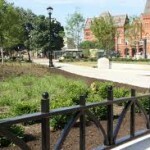 Installed in combination with comprehensive outdoor lighting, well-planned signage, and thoughtfully-engineered landscape design, custom commercial fences are an integral component of any commercial or business property. 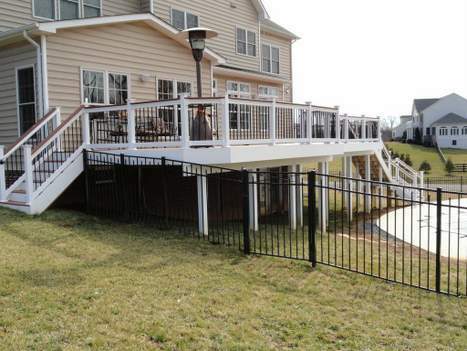 For almost 40 years Hal Co. has partnered with small businesses, corporations, governments, and a range of enterprises throughout Northern Virginia to design, install, and maintain custom commercial fences. Gainesville, VA, businesses can trust the safety, quality, and expertise we offer when designing and planning their commercial fencing systems. Demanding innovative designs are a cornerstone of our commitment to providing high-quality commercial fences in Gainesville, VA. Contact Hal Co. today and learn why our name has been synonymous with high quality, dependable commercial fencing since 1981. Detailed planning is key before you build a deck in Gainesville, VA. The Prince William County Building Development Division handles all activities related to building and construction in the county. Check their website for details regarding deck construction requirements and permitting. Whether you choose to stay within the Typical Residential Deck Design or have a custom deck plan, approval is needed before you can proceed to build your deck in Gainesville, VA. The outdoor construction professionals at Hal Co have over three decades of quality deck installation craftsmanship in the metropolitan Washington, D.C. area. Before you build a deck in Gainesville, VA, we suggest incorporating these tips to make your deck planning experience smooth and satisfying. Select deck materials for appearance, function, durability and low maintenance. Suitable wood species include Redwood, Cedar, Treated Southern White Pine, and more exotic tropical hardwoods like Brazilian Ipè , Mahogony, Teak and Cumaru. Capped and standard composite materials are gaining in popularity, while vinyl, metals, and other materials provide smart alternatives and trim options when you build a deck in Gainesville, VA. Some of the variables to consider before you build a deck at your Gainesville home include topography and landscaping, sun and wind exposure, access to and from your deck, proximity to your kitchen and other amenities, and the need for utilities like electricity, propane, and water. Hal Co, a family owned business licensed and insured in Virginia, is highly experienced and well-qualified to build your deck in Gainesville, VA. We work with all deck materials and can draft a custom deck plan suited to your location, needs, and project budget. The Building Permitting Services Counters at the Prince William County Development Services Building at 5 County Complex Court, Prince William, VA, 22192, are open weekdays from 8:00 – 4:00. Careful review of the permitting application and approval process will help you work with your deck contractor to gather and finalize your permit application. Once your plan is approved, you can start to build your deck in Gainesville,VA. Call Hal Co today to schedule your free project consultation. We’ll answer your questions, explore your needs and assess your property to help you organize your deck planning process from start to finish. Before you build your deck in Gainesville, VA, discover the Hal Co difference.